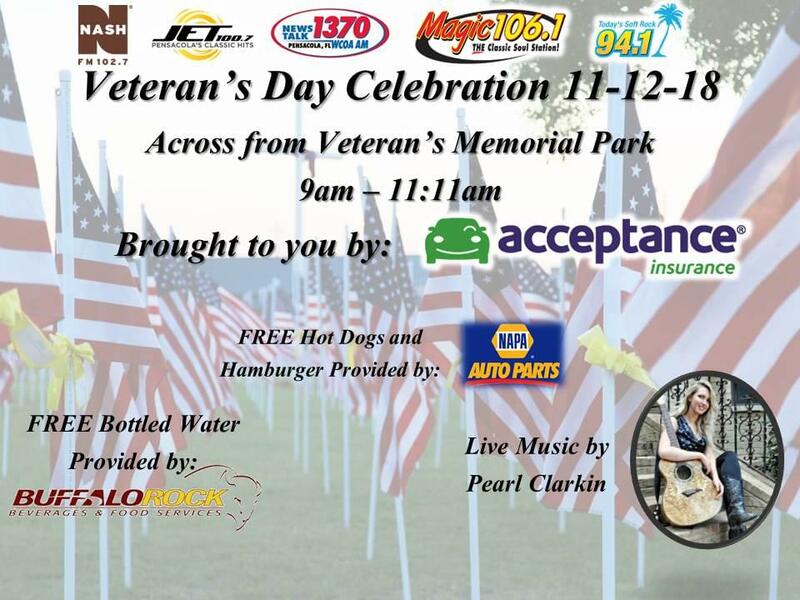 Monday, November 12th, come enjoy the Veteran’s Day parade and celebration! The celebration will take place on the Hawkshaw Property right across from Veteran’s Memorial Park from 9am until 11:11am when the crowd can go over to Veteran’s Memorial Park for the awards ceremony. Napa Auto Parts will provide FREE hot dogs and hamburgers to all past and present military members. Buffalo Rock will provide FREE bottled water. Our very own Pensacola native, Pearl Clarkin will be performing on stage as well! If you have any questions, call Cumulus Media t 850-478-6011. The 2018 Veteran’s Day Celebration is brought to you by Acceptance Insurance. Acceptance Insurance allows you to protect what matters while giving you peace of mind with their affordable policies! To see their website, CLICK HERE.